We will also offer a wurstsalat salad and housemade apple strudel with Sisler's french vanilla ice cream. Supplies are definitely limited. 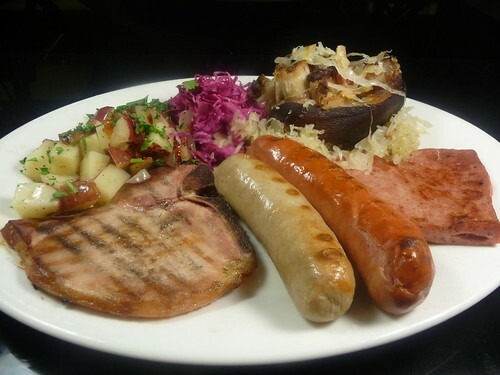 Stop out and sample our German fare after 4 pm each night, beginning Sunday, September 22. You've got a week (maybe more) to try out this authentic German plate. So come in early, and come often - before it's gone! Oktoberfest is known as the largest beer festival in the world. Dating back to Munich, Germany on October 12th, 1810, the 5-day event was originally staged to celebrate the marriage of the Bavarian Crown Prince Ludwig and Princess Therese of Saxony Hildburghausen. Though the official fest in Germany boasts more than 6 million visitors a year who help consume more than 1 million gallons of beer, we at the Uptown are proud to bring a slice of German history and festivities to the Illinois Valley.